First Presbyterian Church in Regina offers a number of educational opportunities for people to learn and grow in faith. The main areas are Sunday School, Nursery Care, Youth and Adult Education. Sunday School begins at 10:30 each Sunday from September to the end of June. There are many fun-filled classrooms for ages 3 to 14. Our teachers are a friendly and committed group of congregational members and we currently use the Bible Quest curriculum, which is very popular with young people. During the summer months, a variety of Christian Fellowship activities are available for children as well, in place of formal curriculum based classes. Classes are structured to provide the optimum learning environment for relative ages of toddlers, children, pre-teens, and teenagers. VISITORS are always warmly welcomed! Pre-Kindergarten and Kindergarten classes (ages 3 – 5) are held in the Kennedy Room, located at the bottom of the stairs. Right next door is the Grade 1, 2 & 3 classroom. Grade 4, 5 & 6 meet in the second upstairs room off the catwalk. Each class is taught by a loving and committed member of First Church’s congregation, all of which have a special affinity for children and teens, and for Christian education. 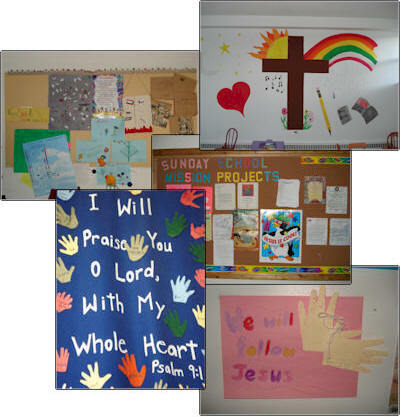 First Church uses the BibleQuest curriculum, which is very popular with students and teachers alike. In addition, several times a year, learning events occur that allow the entire Sunday School to interact together. These are events such as: “Beach Day at the Dead Sea” and “Loaves and Fishes Day” to name just two of the many events. These special “days” are fun filled, energetic events designed to enhance learning about our faith in a different way than regular classroom learning, and are added to the curriculum as an additional method of reinforcing “worship family” connections in our education community and to highlight interesting events in Christian history. First Church has a lovely nursery, located just off the gymnasium, on the lower level of the CE building. Loving members of our congregation are happy to care for babies and toddlers (up to 3 years of age) in this environment so that parents can attend worship in the Sanctuary. There are cribs, cots, bassinets and all manner of equipment to allow babies to enjoy this loving environment. Toys, rocking horses, games and books are also available for older babies and toddlers. In addition, change tables and supplies are provided in the nursery. The Nursery staff are delighted to read to your babies and toddlers, rock them and care for them in a warm, loving, and safe environment while parents connect with the Worship community. First Presbyterian Church has a thriving Youth Group made up of pre-teens and teenagers. The Youth Room is called THE ZONE, which they have uniquely made their own with games and fabulously decorated walls, and other exciting accoutrements. The youth engage in lively activities and focus on engagement with our Christian faith, through fellowship, inquiry and service to the Regina community. Regular Bible Study takes place each Tuesday morning in the Kennedy Room (located at the foot of the stairs in the CE building). Generally this study follows the Common Lectionary, but there are times when it focuses on specific Books of the Bible or situations encountered. Bible Study provides a wealth of intellectual stimulation and exploration of the Old and New Testaments and all of the Bible’s facets. These study events, hosted by First Presbyterian Church, are advertised as they become available. Often, visiting lecturers will present these events. Sometimes these educational study opportunities are delivered by local members of the clergy from Presbyterian Churches in Regina and the surrounding south Saskatchewan area. These events are open to all. Some are free of charge, and others have a nominal fee. Some times these events are included with other fellowship opportunities such as pot luck suppers or luncheons. Both the Presbytery and the Synod offer educational events. These are advertised in advance and are generally open to all. Registration information is generally available on this web site when events occur.